China abandoned its one-child policy yesterday. 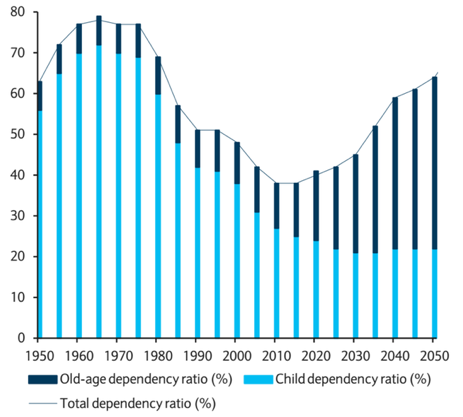 Just about everything I’ve read since explains that this policy shift is a result of fears about dependency ratios; the ratio of the number of non-working age people in the population (children and the elderly) to the number of working age people. As shown in the chart below, China, like most countries, is seeing the start of an uptick in this ratio due to an ageing population. But the simple fact is that increasing fertility rates isn’t a solution to this problem. more immigrants, who both reproduce (more children) and become elderly themselves. The only way population growth can ‘solve’ the age dependency problem is if the growth rate itself continues to grow in a grand human Ponzi scheme. To make this point clear I have poached the data from a great study way back in 1999 by Peter McDonald and Rebecca Kippen. They simulate a number of Australian population scenarios that represent some of the political views at the time ranging from Harry Recher’s view of a one-child policy coupled with zero immigration, to Tim Flannery’s view that a sustainable long-term population target is 12 million, to Jeff Kennett’s view that immigration should be ratcheted up as far as necessary to maintain a constant dependency ratio. I show in the graph below the dependency ratio based on the various population projections in their simulations (final populations in 2100 are in brackets). A few things should be noted. First, the lowest population projection, the Recher model, gets Australia’s population to 5 million by the end of the century and reaches a peak dependency ratio (DR) of about 2.2. The highest population projection, the Kennett immigration solution, reaches a population of 929.5 million (yes, a billion) in 2100, relying on a population growth rate of over 4% to keep the DR at its 1998 level of about 0.7. In between these two extremes we have population paths that lead to populations between 12 and 50 million by the end of the century, all of which result in a DR between 1 and 1.5 by this measure. But here’s the thing. That 0.5 difference in the DR between the radically high and low population projections, can be totally offset by changing the retirement age by just two years - shifting the population at age 65 and 66 from dependent to working age. At the moment the Australia pension age is shifting two years - from age 65 to 67. If social norms of employment change to accompany this, any ageing problem is already solved. In short, what seem like insurmountable demographic shifts are actually relatively slow and minor changes in economic terms. Not only does a declining youth dependency ratio offset much of the increase in the age-dependency ratio, but from the perspective of the economy as a whole the potential costs of ageing are minor compared the economic and environmental costs associated with rapid population growth necessary to suppress this ratio. In these scenarios the dependency ratio is weighted so that a child accounts for 3/4 of a person, and a retired older person (above age 60) accounts for 5/4 of a person.